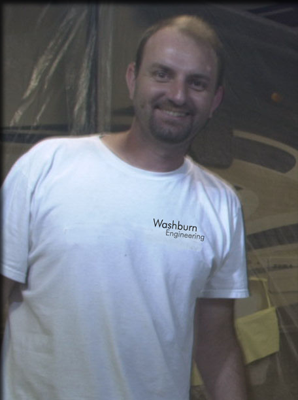 Hello, my name is Mark Washburn, owner of Washburn Engineering. It is our goal to provide the finest in RV repair and RV restoration service. We are a premier automotive painting center specializing in RV body repair, RV roof repair, RV slide-out repairs, collision, and custom painting. We can work with all major insurance companies to meet your needs. Our service area covers Western NC including, Charlotte, NC Shelby, NC Gastonia, NC Rutherfordton, NC Asheville, NC Hickory, NC Spartanburn, SC Greenville SC and the areas surrounding Lake Norman, Lake Lure, Lake Hickory, Lake James and Lake Wylie. Our state of the art repair center was specifically designed to accommodate the repair of the largest RVs, Motor Homes, Winnebago's and Travel Trailers. All repairs are performed inside a climatically controlled environment. Our facility includes an RV clean-up station, a large Repair area, an internal triple filtered paint booth, a wood working shop and a welding station. Our custom built 15 ton air handling system provides both proper heat so that paint will adhere properly and moves plenty of air in order to control overspray. Our state of the art repair center is equipped to do the job right. Scissor Lifts provide a working platform that can be elevated to roof top level thus allowing our technicians a comfortable working arrangement for roof top and air conditioning repairs. Our fork lifts provide a safe and efficient method for slide out repairs. We also have a fully equiped wood working center and we have the ability to replace or repair any internal spars or sturctures. Our technicians have many years experience in major RV collision repairs and restoration. Many local dealerships turn to Washburn Engineering for their major RV repairs. It is our goal to provide expert service at reasonable prices. Your recreational vehicle represents a major investment. Choose a company you can trust to get the job done right.